Hon. Datuk Jahid Jahim MLA, Member of the Supreme Council of the Sabah United Party (Parti Bersatu Sabah)Hon. Datuk Jahid Jahim was born on 29 May 1958 in Kg. Rangalau Lama, Kiulu. He is married to Malianah Ugau and they have 3 children. Datuk Jahid is currently a member of the Sabah State Legislative Assembly (MLA) for the N.9 Tamparuli constituency having won the seat in 10th State General Elections held on 21 Mac 2004. 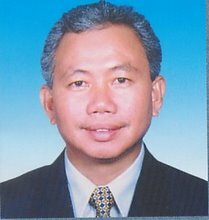 He was subsequently appointed as the Assistant Minister of Youth and Sports in the new BN Sabah Cabinet.Datuk Jahid Jahim serve the people of Tamparuli for about 10 years already and he bring a lot of developtment in Tamparuli town. If you visit Tamparuli now it is totally different compare with eight years ago. For a Tamparuli Civilian like me, I really thankful to have a representative like him. Once in a while I often see him at a wedding ceremony and an official gathering conducted by JKKK and District Office Of Tamparuli. He was formerly with the Sabah Civil Service having served in various capacities as a Senior Officer with the Information Department, Assistant Director of the State Development Department, District Officer of Tuaran, Director of Resettlement Division of the Chief Minister's Department and Secretary of the Home Affairs and Research Unit of the Chief Minister's Department. He resigned from his position to venture into full-time politics in 1991. Datuk Jahid holds a BA (Hons) in Sociology from the National University of Malaysia in 1981. For his contributions to the state, he was awarded the Ahli Darjah Kinabalu (ADK) medal in 1991 and the Ahli Setia Darjah Kinabalu (ASDK) in 1994 by the TYT Yang diPertua Negeri Sabah. In 2009 Hon Jahid Jahim was awarded the Panglima Gemilang Darjah Kinabalu which carries the title Datuk.
" A Good Politician Understand The People " " Contribute More You Achieve More "
Suggestion and an opinion From Admin Tamparuli Sabah. 1. Set Up More Comercial Bank In Tamparuli such as CIMB, AM Bank and Agro Bank. 2. Upgrade the Old Shoplot Building ( British Era ) to Morden building. 3. Upgrade the public facility such as Hospital, Police Station and Post Office. 4. Upgrade public road - not all of the road is being upgrade yet such as Kg Gamirong and Kg Nohirot.